All new for the Summer of 2018, better thermal efficiency, all metal bases and collars, better beam patterns, more light output, better focus. The only LED bulb to have both TUV and E13 certifications. Do not be fooled by the Imitators! The brightest H7 LED bulb available at a true 4800 lumens! 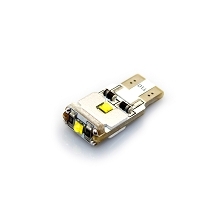 New Cree XHP50 emitters X2 offer superior beam patterns. Fan cooled for extreme conditions. 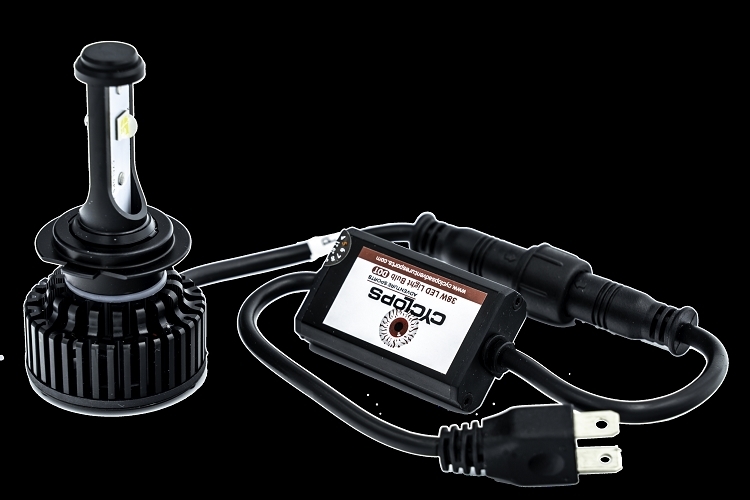 Better than HID performance with the benefits of LED on your auto, bike, quad or UTV. 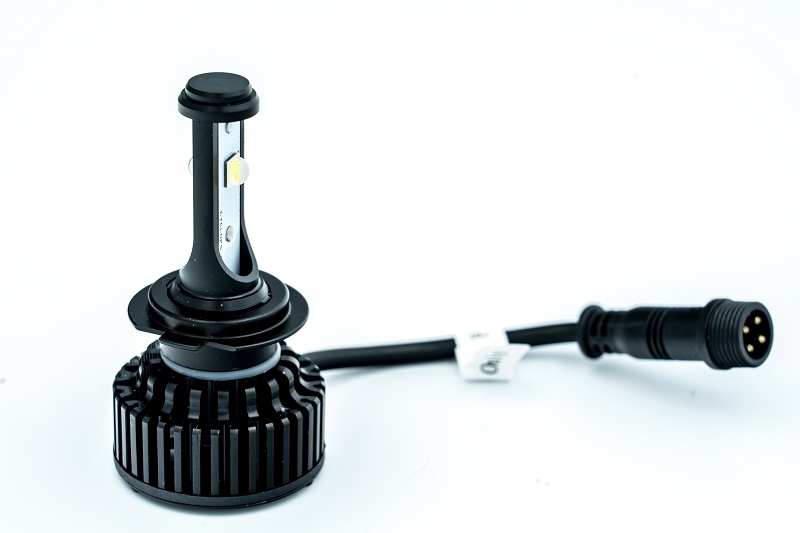 The longest lasting and most reliable replacement H7 LED headlight bulb available. Includes H7 connector. Don't fall victim to poor quality LED bulbs with heat sinks and no fan. They simply will not last in a motorcycle or automotive closed off headlight bucket. 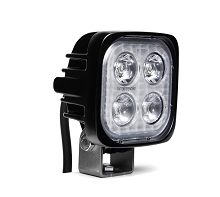 This is the best H7 LED headlight and only available from Cyclops and our select partners. 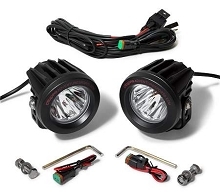 If the bulbs are for a BMW f800, 700, or 650GS please go to THIS PRODUCT. I got my H7s for my K1300S on Tuesday. I had a bit of difficulty getting the adapter rings to seat flush, mostly due to the limited space on the high beams. The low beam was a piece of cake. I only did a quick test and was impressed, but didn't get to do a road test until tonight. I knew the high beams would be fine as far as beam pattern, but I had some concerns about the low beam due to reports with previous generations of your LED bulbs. Well, I had no need to be worried. The beam pattern was almost exactly the same as the halogen bulb, just whiter and much brighter. The low beam went from good to great. The high beams went from good to Oh My God is that the sun! No LAMPF faults yet but I didn't do more than go for gas and take a slightly long route home. In any event I'm very pleased with the results. I can not say how happy I am with this product. I tried a competitors first to save a few bucks. After seeing a friends Cyclops setup in his GS800 and comparing them to my ADV monster mesh in my R1200Gs, I was shocked by the difference. The Cyclops is much whiter, not blue. It also offered a very sharp cutoff and substantially more usable light. The install was a bit of a trick, the instructions did help tremendously. Thanks Cyclops! I called up the guys at Cyclop before placing the order. Wasn't sure if it was going to fit. Because I'm only about 30 mins away from their office, they offered to install it for me if I rode down. But I'd thought I'd give it a try myself to see if it will fit so I placed an order for the H7 kit. It took a few days to arrive and it was a simple unplug and replace installation. The fan was a bit larger so when I close the back cover, I had to ease it in a bit by balancing the pressure from different screws, but that was the only challenge. Once in, I realized how much brighter this looks. Because it fits within the original reflector housing, the light pattern is as good as the old halogen except the intensity is so much stronger. And the color is just awesome, definitely grabbing attention and gaining more visibility. I highly recommend this. The high beams (H1) however is a different story. There's not enough clearance in the housing so the folks at Cyclops recommended that I don't order that part, good call. Once I opened up the housing, I realized that they are absolutely right. Good products. Great service!! Finally I have light when riding in the dark. These bulbs were plug and play for my 2015 BMW C650GT without any issues. Original bulbs just dont compare to these LED's. I just want to say that the installation on my 2013 BMW r1200rt was far easier then I expected. I was nervous about how everything was going to fit. The two piece bulb and collar (can you call a LED a bulb?) makes it very easy. the wires and doodad wraps around the back of the housing and fits in nicely. I did take off the entire head light nacelle which is an experience, but the ease of access to the back of the headlights was well worth it, The removal procedure is pretty much mandatory to replace the parking light bulbs too and it's handy to know how all the plastic attaches to the bike. Needless to say the light quality and brightness is outstanding. Installed the H7 LEDs on all 3 headlights (low/high) of my 2016 BMW K1300s. No issues and the learning curve was on the first light. Took me around 1 hour for all 3 LED units because I was taking my time. What a difference at night! The lights seem a lot whiter too. While I ordered the Canbus resistor unit, so far I have not needed it. I love these lights! Being seen = safety and these lights help me get noticed day and night. One of the LEDs is starting to fail on my low beam so I am purchasing a replacement. I don't really care that I might have to replace the low beam every year+, it's worth it as far as I'm concerned. The performance is excellent and lights afford me some extra wattage to run other lighting/charging/heating gear. No problems with the canbus as well.